In this blog we will learn what a Ball Check Valve and a Backwater Valve are, the benefits of installing them and what application it’s best design for. Ball Check Valves and Backwater Valves are both one-way valves, which are used in sewage systems. Ball Check Valves are installed in the discharge line from a waste water or sewage pump. The valve ensures that the effluent does not drain back into the wet well or sewage pit after the pump stops. This protects the pump from damage resulting from running backwards and hydraulic shock. Energy cost are reduced by eliminating the re-pumping of fluid which would otherwise drain back from the discharge line into the wet well after each pumping cycle. Backwater Valve are installed in the sewer drain line, they provide protection against sewage backing up into the building resulting in property damage due to a clog drain or heavy rains. Installing a backwater valve is a wise decision because no one wants to clean that up. Commonly used in sewage pump stations and applications involving viscous liquids or slurries. They are the most widely used check valve for municipal and industrial backflow prevention. The simple and cost-effective design eliminates the need for expensive swing type check valves, with spring-assist closing, hydraulic cushions, and other accessories used to prevent the check valve from slamming. They are a one-way valve that permits fluids to flow in only the desired direction opening the valve, while backflow forces the valve closed to block the reverse flow. Designed with an internal guide system which moves the rubber-coated ball completely out of flow channel they have low friction loss resulting in optimum performance and minimum pressure drop. The full-ported valve seat is uniquely designed allowing the ball to seat leak-tight without getting wedge into the valve seat when stopping reverse flow. The key reasons for selecting a ball type check valves are there long term, trouble free performance. The ball rolls during operation and changes position with each cycle ensuring the ball never seats in the exact same position twice. The ball is a self-cleaning, anti-roping design which prevents modern trash from clogging or interfering with its operation by ensuring nothing can build-up down-stream from the self-cleaning ball. Making them an ideal valve for submersible wastewater lift stations and sewage pumps applications involving viscous liquids or slurries. The valve’s access port provides ease of maintenance without removal of the valve from the line. Ductile Iron and Stainless Steel Ball Check Valve are available with threaded or flanged connections, PVC Ball Checks Valves are available threaded or solvent weld connections. 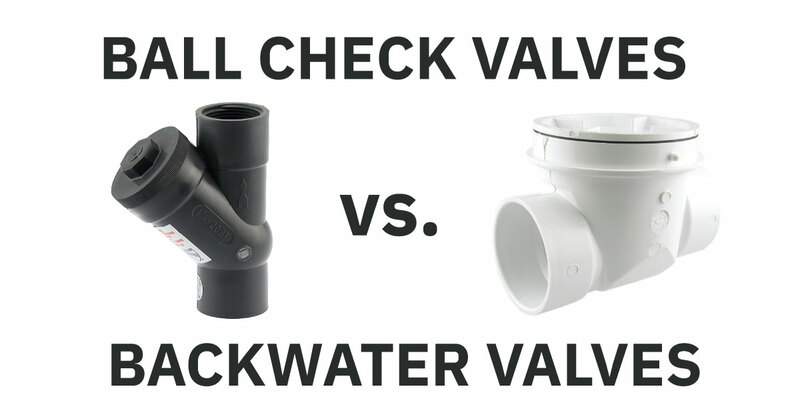 There are two different types of ball check valves. 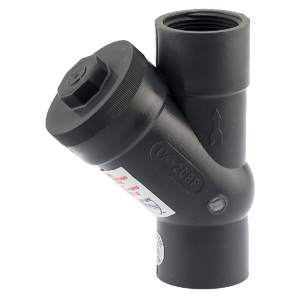 Designed especially for Storm Water, Wastewater and Sewage backflow prevention in residential, commercial, municipal and industrial applications. Most commonly used for submersible wastewater lift stations, sewage pumps and any application involving viscous liquids or slurries. The preferred installation of a ball check is in the vertical position, this will insure that gravity will seat the ball properly each time. However, if the ball check valve is to be used in a horizontal installation, it is important that the static head is at least 20 feet of water. Recommended flow velocity range is 3-5 feet/second. Floating Ball Check Valves are typically used in vacuum or anti-flooding applications. A floating ball is used to prevent overflow of rising water in flood control applications to prevent backflow from drains. They are also used as an air vent to purge air when filling tanks and pipes. Floating Ball Check Valves should be installed in a vertical orientation only and have a minimum of 10 feet of static head to seal correctly. Backwater Valves are a one-way valve which provides back flow prevention for residential and commercial applications whether connected to municipal sewer line or a private septic system. Designed to prevent fluids from backing up and flooding, due to an obstruction in a sewer system or storm drain. They also provide protection against overflowing due to a heavy rain flooding a sewer system. Buildings which are connected to public mainline sewers, are typically designed so that an obstruction in the public sewer will not cause sewage backup into the property. However, private properties which are not connected to a municipal sewer will not have backflow protection and require the installation of a Backwater Valve in the building sewer line. The valve typically installed under the lowest floor containing plumbing fixtures. 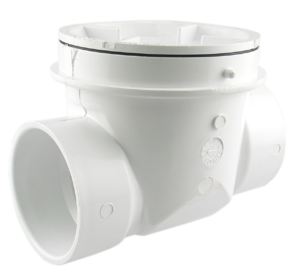 The valve is designed to automatically shut to prevent sewage from backing up into the building from an obstructed sewer. Backwater Valves are a swing check design, which contains a hinged flapper and gasket that automatically closes, ensuring a water tight seal preventing back flow. This is something that many of us don’t think about, and totally take for granted. But with this knowledge we can start to be proactive and know that there are products out there that can maintain and prevent major issues before they happen, or even when they happen, we know why and what is needed to fix them.